This stand was manufactured between 1898 and 1920. 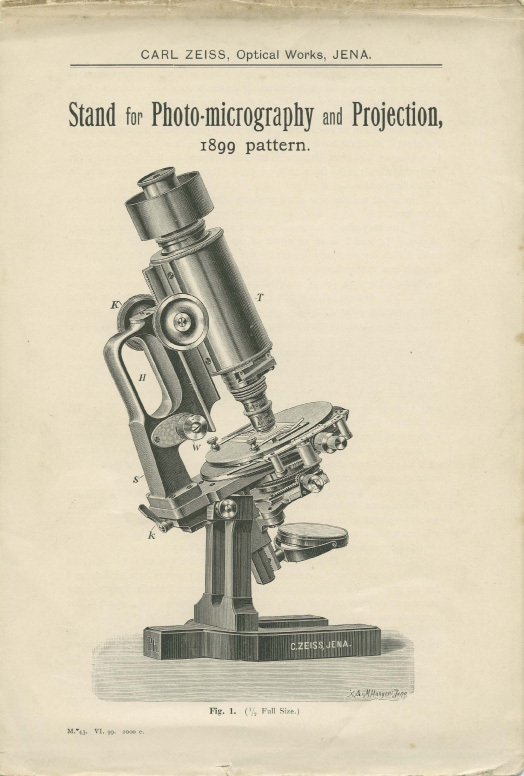 The design was so successful that it was copied by other microscope manufacturers. My particular stand is No. 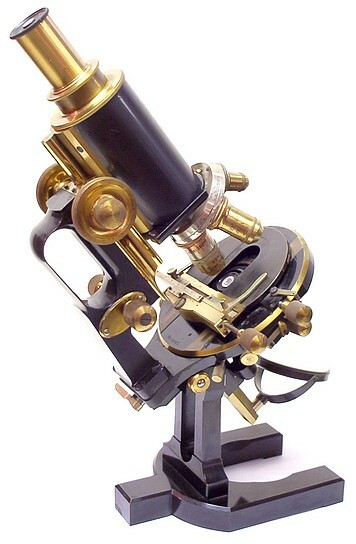 49611 manufactured in 1909, and sold from the Berlin office of Carl Zeiss on Friday 20th August 1909. There are five objectives and five Huygens eyepieces. The eyepieces are Nos. 1–5 magnifying between 3x and 10x. The drop-down condenser is an oil-immersion Abbe-type of NA 1,4. Beneath it is an Abbe substage illuminator for oblique illumination. When a customer ordered their microscope, the objectives were purchased separately, as is the case today. These are all achromat objectives, and at the time (these details are taken from a catalogue dated 1902) Zeiss offered 19 achromat objectives for sale. This microscope has an a* objective in beautiful near-mint condition. The a* is a variable magnification objective with focal length, f, from 43-29 mm, not intended for photo-micrography. At the Continental standard mechanical tube-length of 160 mm, this gives a magnification of 3,7:1 – 5,5:1. No numerical aperture is given, since this changes with magnification, but with my Zeiss Apertometer NA values range between NA 0,08 @ Mag. 3,7:1 and NA 0,25 @ Mag.5,5 – which are comparable to the values for the modern 160mm tube-length (46-20-13) variable magnification objective (Mag.1,6-5,0/NA 0,104-0,32). The AA objective has a focal length of 17 mm (Mag. 9,4:1) and an NA of 0,3. This objective is equivalent to a modern 10x achromat and sold for 30 marks. Based on today’s prices, it would cost £1,430; in fact, Zeiss offer an equivalent high-quality modern 10x achromat for £238 – a factor of 6 times cheaper. The other three objectives are the C objective with a focal length of 7 mm (Mag. 22,9:1) and NA of 0,4; the DD objective has a focal length of 4,3 mm (Mag. 37,2:1) and NA of 0,85 (surprisingly, it is not equipped with a correction collar) and the 1/12” homogeneous immersion objective has a magnification of 75,6:1 and an NA of 1,30. Zeiss manufacturing has always been about quality. As a professional microscopist, I have been fortunate to be able to visit the Zeiss production lines in Jena, Oberkochen and Göttingen. The craftsmanship and quality control are simply astounding. As an exercise for my own curiosity, I compared the antique objectives on my stand to those of two modern (Axioplan 2, 1999 and Axio-Examiner Z1, 2011) microscopes that I work with. The 1909 vintage AA objective showed better contrast transfer into the image of the high contrast monochrome subject than the semi-apochromat of the same NA manufactured ninety years later. The higher magnification DD NA 0.85 objective compared very favourably with the 1999 semi-apochromat. You can see the report here. An enlargement of the Antoni van Leeuwenhoek micro-photograph (10x objectives) is shown here, and the stained histological slide (40 x objectives) here. 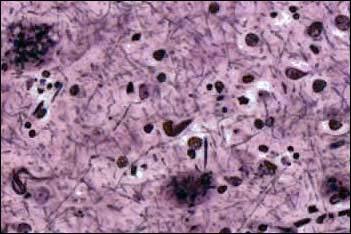 It was the Stativ 1c ‘jughandle’ microscope that was used by Alois Alzheimer in 1906 to describe amyloid plaques and neurofibrillary tangles from slides of brain tissue of two of his patients. I am very fortunate that my wife instructed me to spend what I needed to acquire this microscope, for ‘life is short’ – I didn’t need telling twice! Finally, many thanks to my good friend Chris Guérin, a connoisseur of antique microscopes, for leading me astray and pointing me in the direction of this truly beautiful instrument. Modern study of Alzheimers Marie N. Bongiovanni et al. ‘Multi-dimensional super-resolution imaging enables surface hydrophobicity mapping.’ Nature Communications (2016). 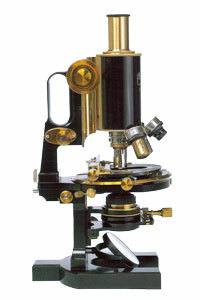 Some of us consider that the best designed and manufactured microscopes date post-war from the 1950’s, 60’s and ‘70’s. Amongst these are the grey Carl Zeiss (Oberkochen) stands, including the Standard, the WL and the Ultraphot. 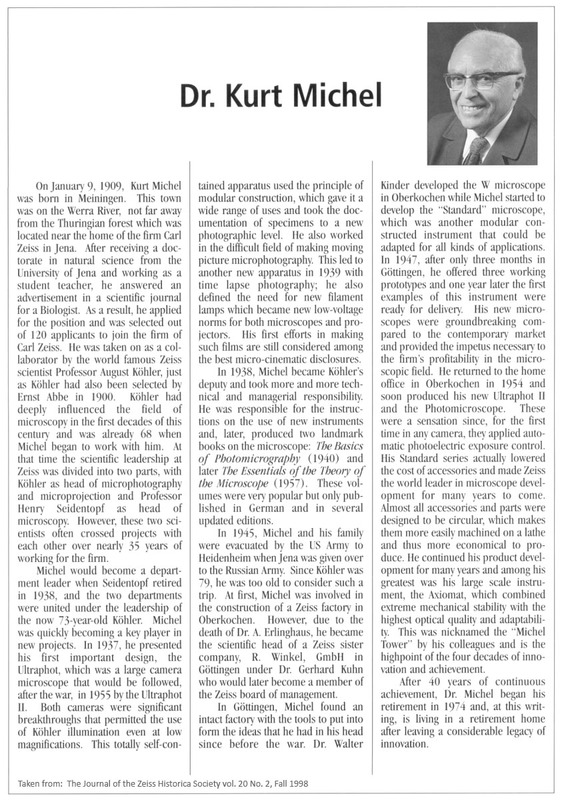 Kurt Michel first designed the Ultraphot in 1937, as a revolutionary modular design employing Köhler illumination even at low magnification. If you are a devotee of the ‘grey stands’, have a look at this PDF (in German), look at Dave Walker’s page and visit Spike’s pages. These pages of Spike’s photomicrographs are also worth looking at.